Dealing with the current crisis isn't enough, because this crisis is unending. As the Attawapiskat teen who confronted Bennett pointed out, our First Nations are living in third-world conditions, and that needs to be dealt with first. We need to build livable houses with access to drinkable water. We need to hire permanent local mental health care workers and addiction specialists. We need to get adults jobs, be it developing local resources, producing and selling traditional goods or telecommuting to office jobs. As Bill Yoachim of the Snuneymuxw First Nation on Vancouver Island told CBC when asked about the suicide crisis: "We need to create space, whether through sport or culture or recreation, to make people feel alive." "The current system, as it is now, it's not working. It's unable to meet the needs of our families and communities. We have 10-year-old kids taking their lives. Something is terribly wrong." Grand Chief Alvin Fiddler of the Nishnawbe Aski Nation in northern Ontario, a confederation including the Attawapiskat First Nation, told me this in February for an article I was writing on Canada's child suicide crisis. Yes, February, where the youth suicide rate was already 50 times the national average. Something was terribly wrong. Something is terribly wrong. And something will continue to be terribly wrong unless our governments start acting rather than reacting. 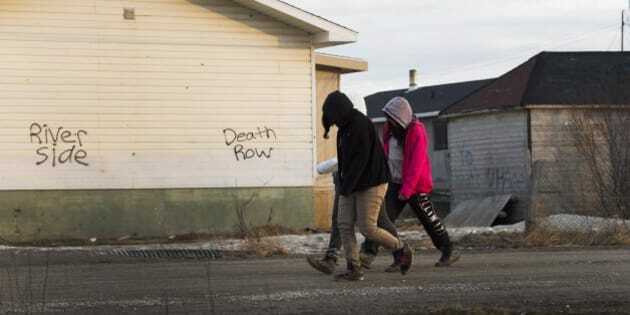 The latest crisis erupted came to light when Attawapiskat declared a state of emergency on April 9 in response to 28 suicide attempts in March and 100 since last September, seven of which involved children under 14. This declaration was made hours before the local 15-bed hospital was flooded with seven kids between the ages of nine and 14 who had tried to kill themselves. There were four other attempts in that same 24-hour period. Two days later, they broke up a suicide pact between 13 youths, including another nine-year-old. There hasn't been a regular mental health worker in Attawapiskat for the past nine months. During those nine months there have been 100 suicide attempts and at least one death. Then last Friday night, April 15, another five children attempted to kill themselves. This all happened in a town of 2,000 people where, as the Toronto Star reported, the hospital "has no full-time doctors -- they fly in four days a week, three weeks out of the month -- and on weekends and evenings only two nurses are on duty. There hasn't been a regular mental health worker on the reserve for nine months because of a shortage of housing." Let's reiterate that point: there hasn't been a regular mental health worker in Attawapiskat for the past nine months. During those nine months there have been 100 suicide attempts and at least one death. The story I was working on in February was prompted by a 10-year-old girl who killed herself in Bearskin Lake, a small Oji-Cree First Nations community about 550 kilometres west, as the crow flies. She was the youngest in a cluster of five youth suicides in the territory since December, and the second 10-year-old suicide in under a year. There was also "The People's Inquiry Into Our Suicide Pandemic," so named because they received no government funding, presented at the NAN Winter Chiefs Assembly in January. It focused on nine communities in the Mushkegowuk region, including Attawapiskat. At the time, Grand Chief Fiddler called for an emergency task force of senior officials from all levels of government to move beyond the current crisis-oriented approach. He asked for funding for a short-term emergency response team and a long-term strategy for suicide prevention that incorporates mental health services, counselling and addiction treatment. Three months later, Indigenous and Northern Affairs Minister Carolyn Bennett finally stopped by Bearskin Lake, the day after visiting Neskantaga First Nation, which has been under a suicide-related state of emergency for three years and lost another 14-year-old in January. Bennett was en route to Attawapiskat where one aboriginal youth asked her, "Tell me why we First Nations we live in third-world conditions. Why is it so easy for the government to welcome refugees and offer them first-class citizenship in our country? When will Canada wake up and open its eyes to First Nations communities?" Bennett's visit followed one by Ontario Health Minister Dr. Eric Hoskins. CP reported he described his visit as "just as devastating as the years he spent as a doctor in war zones around the world." "It's deeply upsetting that when you have children that young that are in such pain or have lost hope -- that they're turning to that kind of consideration," Dr. Hoskins said. "It just demonstrates just how serious this situation is and how important action is." Well, yes, but the situation was serious long before April and action was just as important then as now. "When will Canada wake up and open its eyes to First Nations communities?" Speaking of, I reached out to Ontario's ministry of health on February 12 -- "Subject: re: preventing child suicide" -- to ask about why the People's Inquiry was self-financed, what their response was to Grand Chief Fiddler's call for an emergency task force, and to find out about current or future indigenous suicide prevention plans. I received no response. Following up a few days later, I was told to contact the Ministry of Children and Youth Services because "child suicide" was their purview. After pointing out my questions were not directly related to children, the spokesperson said "I'll see what I can find out." I did hear back from the Ministry of Children and Youth Services who informed me that the Nishnawbe Aski Nation received $49,000 to combat youth suicide in 2013 and a little under $200,000 in each of the following two years. They said that a total of $9.2 million has been earmarked for the Aboriginal-specific component of Ontario's Comprehensive Mental Health and Addictions Strategy, which includes funding for hiring of workers, training and expansion of telepsychiatry. As far as the People's Report and the emergency task force, the Ontario government was "currently reviewing the recommendations." Yet all that funding still didn't get Attawapiskat a regular on-reserve mental health worker for the past nine months during a spate of 100 suicide attempts. That position was finally filled on April 18. Dr. Hoskins just announced plans to bring in 13 mental health workers, which is great, but why not three months ago? Or nine months ago? Meanwhile, the federal ministry of health finally got back to my questions about two weeks after I asked them, long after my article was published, telling me that "the issues of suicide and mental wellness faced by First Nation communities are serious and continue to be a priority for Health Canada." Their plans sound bold, including spending $1.5 million each year in Ontario to support community-based suicide prevention and mental health initiatives as part of the National Aboriginal Youth Suicide Prevention Strategy, and funding crisis response services as well as cultural and emotional support services offered to former Indian Residential School students and their families. But once again, this funding failed to result in a regular mental health worker in Attawapiskat for the past nine months. Nor did it prevent the waves of suicides and attempts that keep crashing across northern Ontario. "The chief is very clear: we need to work no longer Band-Aid and piecemeal," Bennet said, while talking about long-term plans and promising a new youth centre, and this is the key takeaway. An attempted suicide is a cry for help, and it's time we as a country listened. But dealing with the current crisis isn't enough, because this crisis is unending. Of course, Grand Chief Fiddler said the same thing months ago, telling me that the government is "trying to put out these fires" until their resources are required elsewhere and that "different agencies try to do different things to support the community but what the community is asking for is a longer-term presence. There has to be comprehensive [strategy] in place." An attempted suicide is a cry for help, and it's time we as a country listened. But dealing with the current crisis isn't enough, because this crisis is unending. As the Attawapiskat teen who confronted Bennett pointed out, our First Nations are living in third-world conditions, and that needs to be dealt with first. We need to build schools and increase graduation rates, and get them the cultural, athletic and entertainment programming that kids get everywhere else across Canada. As Bill Yoachim of the Snuneymuxw First Nation on Vancouver Island told CBC when asked about the suicide crisis: "We need to create space, whether through sport or culture or recreation, to make people feel alive." Jean Chretien and various right-wing columnists are calling instead for indigenous communities to abandon their remote reserves because this is going to cost too much money. But we did take their land, and then we took their children. The least we can do now is help save their children so that they can stay on what land they have left, because this is going to cost too much money (though it's more about how it's spent than how much).